HII everyone! This is another back to school related post. If your going into year 7 or just want some tips or advice for back to school then keep reading. Hope you enjoy ! Comment below what your looking forward to and not looking forward to about going back to school. Tip 1- Be yourself... Everyone thinks senior school you have to be like everyone else but you there isn't an exact way to look or be. So be yourself and people will like you for you and not a a model of someone else! Tip 2- Dont be afraid to socialise- Having friends in senior school is sooo important so the first day try and mix it up with new people or if your going into year 7 be confident and make new friends. Tip 3- Be confident- Linking into the last too, you might be laying in your bed the night before thinking. OMG what if no one likes me, what if I'm late for class, what if I can't find the toilet ! Trust me everyone else is NERVOUS. So be confident, smile and be yourself and YOU WILL BE ALRIGHT. Tip 4- Stay organised- being organised in school is so important so either use the planner they give you or use your own. Make sure you write down homework due dates, test, important dates etc. Being on top of you school work will make your school life so much easier. Tip 5- Dont worry too much- I really need to not worry as much. School is annoying the early start but teachers are there to help you achieve and when a test comes up I worry like crazy as I want to do my best but you need to try and think if I don't do as well, I'm not going to die, it won't effect the rest of my life etc. So try not to worry too much even though I'm a worrying person! 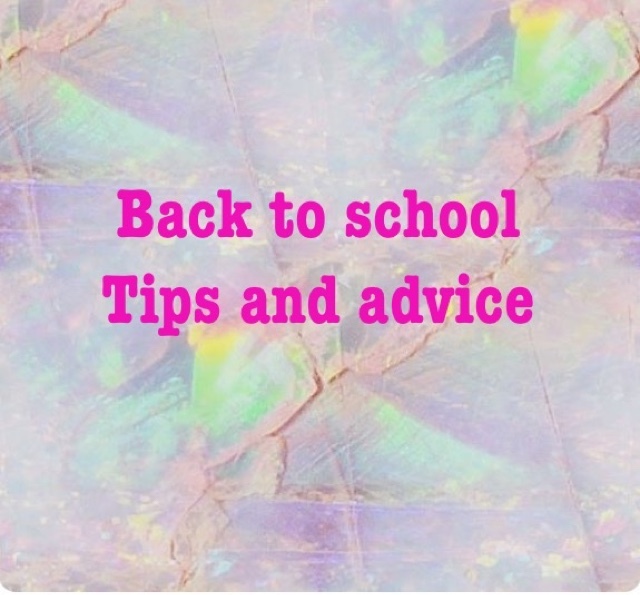 So here are 5 tips for back to school. I hope these help and comment down below what year your going into to.